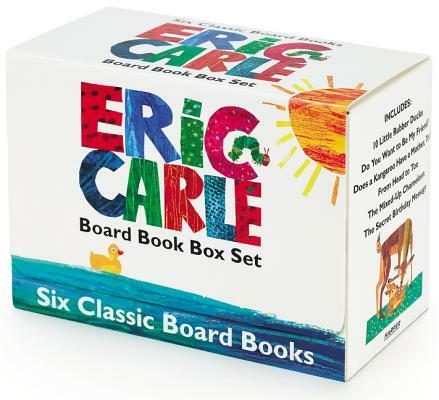 From beloved and bestselling author-illustrator Eric Carle comes a box set with six favorite board book classics. Carle’s signature colorful collages have delighted children for generations, and this is the perfect gift for baby showers and new parents! With simple, engaging text, these Carle favorites include concepts to help teach young readers more than just reading! 10 Little Rubber Ducks is about counting, Do You Want to Be My Friend? portrays companionship, Does a Kangaroo Have a Mother, Too? illustrates every mother's love for their child, From Head to Toe focuses on actions, The Mixed-Up Chameleon teaches about colors and body parts, and The Secret Birthday Message tackles shapes. Eric Carle is the creator of more than seventy picture books for young readers. Eric Carle was born in New York, USA. However, when he was just six, he moved with his parents to Germany. In 1952, after graduating from the prestigious Akademie der Bildenden Künste in Stuttgart, he fulfilled his dream of returning to New York. Eric Carle has received many distinguished awards and honours for his work, including, in 2003, the Laura Ingalls Wilder Award for his lifetime contribution to children's literature and illustration. In 2002, fifty years after Carle's return to the United States, The Eric Carle Museum of Picture Book Art was opened in Amherst, Massachusetts. Here visitors of all ages can enjoy, in addition to Eric Carle's work, original artwork by other distinguished children's book illustrators from around the world.